MOVIE REVIEW: Public Enemies, Michelle finally gets around to seeing it! So far this summer movie season is turning out to be one massive crop of bland, dud. Of course I knew this going into the summer when I wrote a post a few months ago listing the 10 summer movies that I had absolutely no interest in seeing, in that post I also mentioned a movie that could not possibly fail. I mean this movie had an amazing trailer, great cast, great director, cool story, how could it possibly get messed up? Well somehow Public Enemies screwed up. It’s one of those films I watch thinking to myself, “yeah, I like it but why don’t I love this?" It’s a beautiful looking movie, with a gorgeous cast, I mean, really, it has Johnny Depp, Christian Bale and Marion Cotillard. 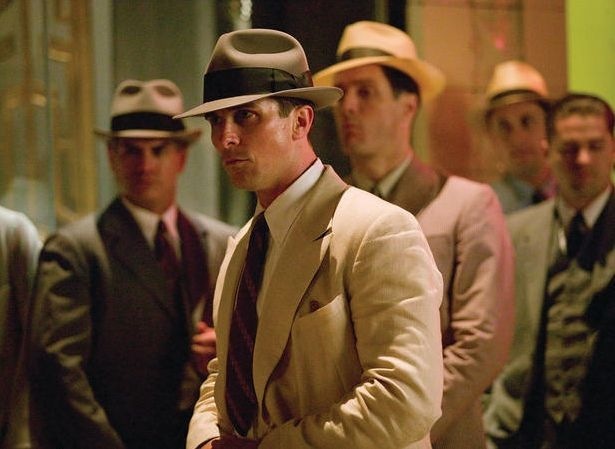 The problem with Public Enemies and almost all of Director/Producer Michael Mann productions is that they are always all flash and style, but have very little substance behind them, from Miami Vice (The TV Show and Movie) to Heat to this. You can watch his stuff and be wowed by how visually beautiful and colorful everything is but then there’s not much else there. Never once did I believe that this 40’s era tale truly existed in the "real" world. Everything – the cars, the streets, the buildings, the actors all looked too clean and shiny. Even the Prison looked like you could eat food off the floor. In this era where we all hate banks (as Mojo Nixon once sang) does Hollywood really want to put out a film that glorifies bank robbers? Apparently yes. In the beginning we like Dillinger, he’s an everyman hero, only he doesn’t give the money he steals to the poor he keeps it for himself. Once the FBI gets on his trail things start to spiral out of Dillinger’s control and bodies start to pile up. The film is well paced although there are moments in the middle where it drags a bit; it feels like it’s about 45 minutes too long and considering the movie is almost 2 1/2 hours it really doesn’t delve that deeply into the characters. We don’t find out much about what made FBI Melvin Purvis (Bale) tick and Bale, while really good here, didn’t have much to do or say in this other than mug for the camera. Depp seemed to have a lot of fun with this part. He looked the part and had the cocky bank robber swagger down. Mann filled the movie with numerous shootouts that were all well staged. This is the part of the review where I really run out of things to say, so I’ll just end it, as I began it. I liked this movie, but ultimately it fails to live up to its potential because it’s too "well" made and at the end of the day I left the theater wondering why did I bother to watch it, it’s a hollow experience. Previous PostMOVIE TRAILER: Soul Power, Very Cool ClipNext PostMOVIE NEWS: Green Lantern is Closer to being Cast! Could it be Justin, Ryan or Bradley? I have to agree. It looked visually appealing and who doesn't love Johnny Depp being a badass? But at the end of the movie, and what seemed like the day, the storyline was hollow and convoluted. costume party and silly non believable romance. Good for the women who just lap up fakey stuff. Although, I did think the gal pulled it off for the final cry.